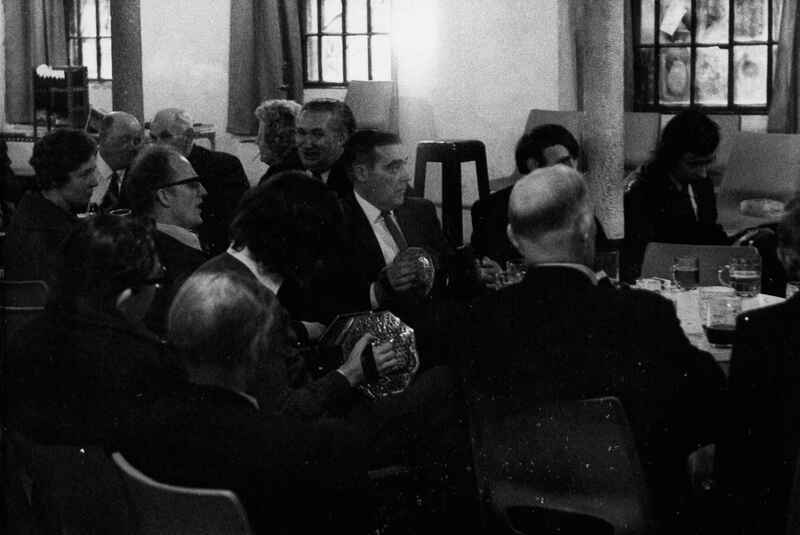 Full Description: This image is of a session at the Kendal Concertina Convention, including members of Colonel Sanderson's Memorial Concertina Band (one of the Concertina Bands associated with the many Orange Lodges still active in the City of Liverpool in the 1970s) and famed collector and player Harry Hatton. Neil Wayne had recorded several Orange Lodge Bands in the early 1970s, and invited Colonel Sanderson's Memorial Concertina Band to perform at the Kendal Concertina Convention. There are tracks from two such concertina bands on the Free Reed 3-CD compilation "This Label is NOT Removable" - visit www.free-reed.co.uk/frtcd25 . The photograph is one of the archive of photographic images taken at the Kendal Concertina Convention, 1973 by Paul Adams (now head of the Fellside record label). The two major events held at The Brewery Arts Centre brought together many younger players new to the instrument, and older players such as Harry Hatton, Frank Butler, Arthur Austin, and the remarkable Colonel Sanderson Memorial Concertina Band from the Liverpool Orange Lodge fraternity. The photographs are © Paul Adams, and used with his permission and with our thanks.